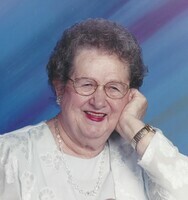 Provide comfort for the family of Evelyn Ange with a meaningful gesture of sympathy. AVON - February 8, 2019 at age 93. She is survived by her children Anthony (Dawn) Ange of Greigsville, Deborah Dugan of MD, Patricia (Ronald) Sank of Leicester; grandchildren Lewis “Ricky” (Theresa) Scarlato, Joseph (Rebecca) Scarlato, Justin (Olivia) Koschara, Alicia Dacey, Megan Ange; 9 Great Grandchildren and one on the way; several nieces and nephews. Evelyn was predeceased by her husband Louis Ange; second husband Anthony J. Pudetti; son Louis Ange; daughter Clara Cilano. The Ange family would like to thanks the Avon Nursing Home staff for the loving care granted to Evelyn during her stay. Family and friends are invited to call Thursday 2 - 4, 7 – 9 PM at the Stephenson – Dougherty Funeral Home, Inc. 350 Genesee Street, Avon where her Funeral Service will be held Friday at 11 AM. Interment St. Agnes Cemetery, Avon. In lieu of flowers memorials may be made to the American Diabetes Assoc. 160 Allens Creek Road, Rochester, NY 14618 or Avon Nursing Home 215 Clinton Street Avon, NY 14414. Debbie, I am so sorry to hear about the passing of your mother - 93 years young!!! What a lovely thing to have 9 decades of love, yet the loss is still intense. Time is a "funny" thing that way... I hope that your warm memories help you smile and the joyful retelling of your favorite stories keep her spirit alive and with you. I send you healing vibes as you grieve. My sincere condolences to you and your family on your loss. Tony, Dawn and Family, Chris and I are so sorry to hear about your loss. May The Lord be with you all!